The most powerful production models in Cadillac history. Vehicles with thunderous horsepower and lightning fast reflexes, completed by brilliant stopping power. They are as formidable on the track - where performance capabilities make everything possible, as they are on the street, where they make every drive infinitely memorable. This is the V-Series, the pinnacle of Cadillac’s performance engineering. Every vehicle is meticulously crafted inside and out to help you become the best driver you can be. And perfect execution of every inch and detail is the only acceptable standard. It can be found in a perfectly balanced camshaft and the rhythmic power it creates. Found, too, in an audio speaker that sits so perfectly in a leather panel it appears to float. It is craftsmanship and an attention to detail as breathtaking as a perfectly executed curve. The performance-focused cabin brings driver support and convenience to its pinnacle. Every aspect of stability, control and attention to detail has been elevated with one focus in mind: the driver. It is design invoked with a performance attitude. When you see the refined finishes, prestige touches of the cabin, the intricate matte carbon fiber trim and sueded microfiber accents, you will know that you are inside a Cadillac. And with the signature thick-rim steering wheel complemented by magnesium paddle shifters, this sophisticated interior elevates the driving experience for everyone who gets behind the wheel. Both beautiful and functional. Every design element serves a deliberate, functional and aesthetic purpose. Innovations in everything from aerodynamics to materials result in an intimidating sum of its parts, both on the street and at the starting line. From the aero splitter and hood to the quad exhaust tips, rear spoiler and diffuser, everything is designed for more than just looks, to support the car’s performance capabilities – including mass reduction, aerodynamics and enhanced cooling. Available RECARO® front seats feature a handcrafted shape that cradles your body during cornering. Along with slip-resistant sueded panels and adjustable bolsters, their design takes the work out of staying in place during aggressive maneuvers. And Memory Pneumatic Lumbar Support counters the stresses associated with sitting, especially on longer drives. Bred for the track, but certified for the road. A refined daily driver, the Cadillac V-Series vehicles are derived from track competition and designed to be capable of race-day performance straight from the factory. V-Series ZF electronic power-assist steering adjusts its timing for precise, quick and deeply satisfying steering feedback. Front and rear Brembo® brakes are standard V-Series equipment. Front mono-block brake calipers are carved from a single block of lightweight aluminium alloy —for firm pedal feel and unmatched confidence. Front brake discs feature a two-piece rotor design for superior heat resistance, performance and durability. In addition, a class-exclusive Ferritic Nitro-Carburizing process greatly reduces corrosion on the rotors, helping maintain stopping power and prolong brake life. Sport 2 or Race. During aggressive cornering — or on curvaceous on/off ramps — the electronic Limited-Slip Differential (eLSD) automatically directs power to the rear wheel with the most traction for great control and fast exit speeds. With No-Lift Shift, you don’t have to let off the gas when switching gears. This keeps the turbochargers spooling, so there’s a faster return to full power when you re-engage a gear. Launch Control monitors traction activity, allows engine, transmission and suspension to work together for maximum, full-throttle acceleration off the line, resulting in better 0-100 times. 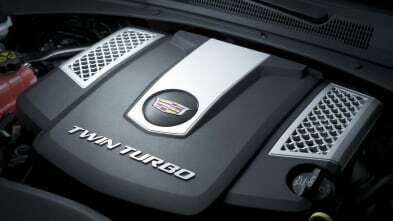 The CTS-V is the most powerful Cadillac ever built, pushed to the brink by the 6.2L supercharged V8 engine. A compact, efficient 1.7 liter, 4-lobe Eaton® supercharger, with specially engineered rotors, generates boost early in the rpm band for faster response. 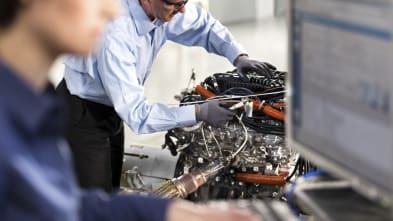 And direct injection, continuously Variable Valve Timing technology and Active Fuel Management make everyday driving as efficient as it is exhilarating. 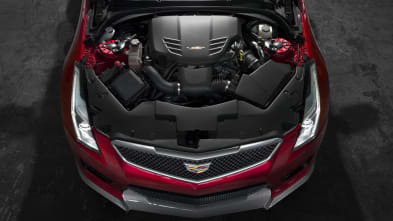 The 3.6L Twin-Turbo truly powerful V6 engine lies at the heart of the Cadillac ATS-V. The high-strength, lightweight titanium connecting rods, low-inertia titanium aluminide turbine wheels with optimized compressors and a patented low-volume charge-air cooler create near-immediate torque response and dramatically reduce get-up-and-go-times. The TREMEC 8-speed automatic transmission is equipped with an incredibly satisfying short-throw shifter and dual-disc clutch. Combined with features like No-Lift Shift and Active Rev Matching, it’s perfect for harnessing V-Series power. The transmission features Performance Algorithm Shifting. Automatically activated by intense g-forces, this technology seamlessly selects the best gear for quicker shifts and faster lap times. For even more control, Magnesium Paddle Shifters let you tap through the gears for refined acceleration and deceleration. A stiffened, lightweight structure allows the V-Series to be track-capable from the factory. The V-Series boasts a multi-link MacPherson strut independent front suspension, focused on delivering a quicker response and lateral control. 5-link independent rear suspension achieves all-out track performance while maintaining everyday comfort. Review your run. Improve your times. Performance Data Recorder available for V-Series vehicles captures your track driving — recording video, audio and performance data in real time. Everything can be viewed on the Cadillac CUE®screen or saved on an SD card to watch later. The system’s four overlays — Sport, Track, Performance or Tour — help analyze your skills. For an even more detailed analysis, the Performance Data Recorder can be used in conjunction with the Cosworth Toolbox. Used by professional racing teams, this software provides a turn-by-turn breakdown of your run to improve your driving skills. While V-Sport represents an exclusive features package curated for more dynamic driving, the V-Series is an entirely new breed of vehicles, built from scratch for utmost performance. The Cadillac CTS V-Sport Sedan is a more performance-oriented version of the CTS Sedan, slotting between the “standard” CTS and the high-performance CTS-V. For the 2017 model year, the CTS V-Sport receives several new features, equipment changes, and colors. This enhanced package features a 12.3'' HD reconfigurable gauge cluster, full-color Head-Up display, Tri-Zone Climate, 20-way adjustable front seats and heated outboard rear seats for the utmost in comfort and control. In just 4.4 seconds, the 420-hp, twin Turbo V6 engine propels the CTS V-Sport from 0 to 100 kmh. While the XTS V-Sport Platinum model is equipped with a 410-hp, Twin Turbo V6 engine propels the CTS V-Sport from 0 to 100 kmh. While the XTS V-Sport Platinum model is equipped with a 410-hp, Twin Turbo V6 engine paired with an advanced 6-speed automatic transmission. A variety of sophisticated handling and vehicle management features like Magnetic Ride Control and Brembo front brakes ensure all this power remains firmly under your control. At the same time, the 2017 CTS-V dominates the road with a supercharged 6.2L V8 engine and an 8-speed automatic transmission plus structural and suspension components for decisive steering and cornering. It takes you from 0 to 100 in just 3.7 seconds, offering you a supreme 640-hp and 854 Nm of torque.